Eight photographs of the Kansas Emergency Relief Committee Transient Camp located at the site of Lake Wabaunsee, near Eskridge, in Wabaunsee County, Kansas. The barracks buildings were constructed in December 1933 by George Rinner Construction of Topeka, Kansas. Several of the photographs were taken in 1934, the first year of the camp's occupation. The caretaker's house at Lake Wabaunsee, built in 1934, burned on December 5, 1936. Clyde H. Forinash worked as instructor to help rebuilt the house. After the dam was constructed in early 1936, engineers found it to be faulty, and it was removed and re-cored to assure its structural integrity. 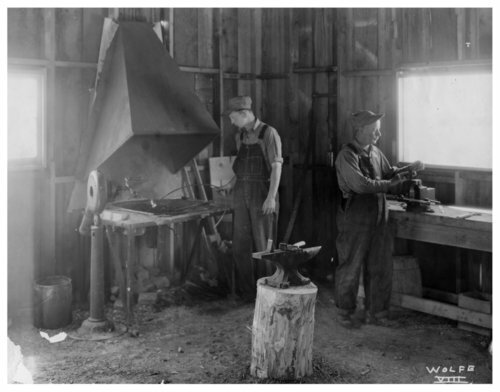 Kansas Emergency Relief Committee transient camp at Lake Wabaunsee - Two men are seen working inside the blacksmith shop.